We have a large supply of bronze tees in our inventory. Our bronze tees are made of high-quality bronze and are available in many sizes to meet your required piping specifications. Our bronze tees are available in a variety of sizes to meet your project specifications. We offer bronze threaded tees and other bronze pipe products to complete your project needs. We also have a very large inventory of stainless fittings. View an overview of our product offerings. Take a look at our bronze tee product dimensions for reference and selection. Please review our elbow product dimensions to confirm your specifications. We have a variety of bronze tee sizes and other complimentary bronze fittings and pipe products to choose from. Our pipe sizes and weights chart will help you search needed tee and pipe product specifications. Bronze tees conform to ASTM B62-93 (85, 5, 5, 5) C83600. Dimensions ANSI B 16.15, Threads are ANSI B2.1 or BA21 and Fed. WW-P-460 UL/FM approved. View our standard specifications chart. We also carry a full line of stainless steel pipe, fittings and other products. View various grades of stainless steel. We house hundreds of bronze pipe products and offer various custom fabrication services to meet custom specifications. This Reference Catalog identifies forged stainless steel and other pipe fittings. Review theoretical bursting pressures for various stainless steel pipe. 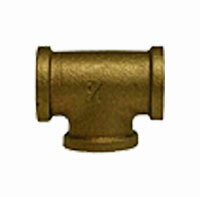 Pipe tees, including bronze tees, are the most common of pipe fittings. Pipe tees are used to combine or divide fluids or gases. Tees change the direction of fluids and gases in a piping system and can connect pipes of different sizes and diameters with a reducing tee. When checking size of tees the measurement used is (x end, x end, x center).